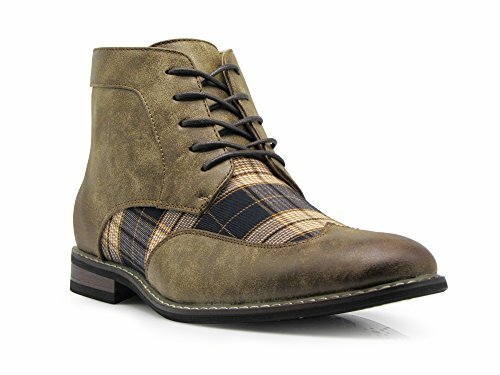 These fine spectator plaid ankle boots with two tone colors upper, faux leather + plaid canvas material, wingtips with perforated. This is not only a pair unique and stylish dress boots, they will also be functional. It's the best looking shoes for musicians,swing dancers and men who admire the glorious twenties and thirties. The two tone color spectator shoes look fantastic with white flannel slacks or brown suits. That will more likely earn "Oh, how elegant" compliments. It can be used as formal wear or casual or costume party. It is a perfect shoe for weekend outfits, casual Fridays, outdoor weddings or garden parties when paired with a sport coat and solid pants. It will always exude the flair of the Golden Age of men's style and elevate your outfit. The key is to keep all other pieces subtle, so the shoes can shine without overpowering your outfit.Why paying hundreds for a pair high end shoes that you can get the same looking pair for much lower here.